I couldn't wait to get my hands on this book after I saw it on BookSneeze (Thomas Nelson provided it to me for review). 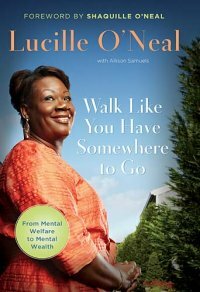 Written by Shaquille ONeal's mother, it chronicles her life in her own words. This was a quick and easy read- I was happy to pick it up and see what would happen next. Lucille wrote very candidly and did a great job conveying her feelings about growing up in difficult circumstances, becoming an unwed teen mother, and eventually having a very famous son. Although my faith is a little different than hers I liked learning about her beliefs and how they saw her through difficult times. I loved when she talked about dressing up her baby doll little boy and found myself identifying with her a lot (particularly as a very tall woman!) This uplifting book left me feeling positive and proud of her for accomplishing so much. I was pleasantly surprised that it didn't focus only on Shaq but on how he changed her life for the better. I've already recommended this to my husband and mom and know others will like it, too. I love my family, the color red, and making things beautiful.